Yesterday I was completely wore out… But luckily my brain was still half working because right before I left to work I remembered I had some of T’s Mom’s frozen meatballs in the freezer.. Phewff!!! In a medium skillet, add a dash of olive oil. Over medium heat add the garlic, onions & mushrooms. Let them saute until tender. Then add the mushroom soup, the gravy mix, Worcestershire, & red wine vinegar. Whisk to mix. Bring to a slight boil, then let it simmer for 3-4 minutes, stirring occasionally. Then add salt & pepper to taste. I added a lot of pepper!! I then added my meatballs to let them soak up some sauce. But you can also just pour the sauce over your dish before you serve. 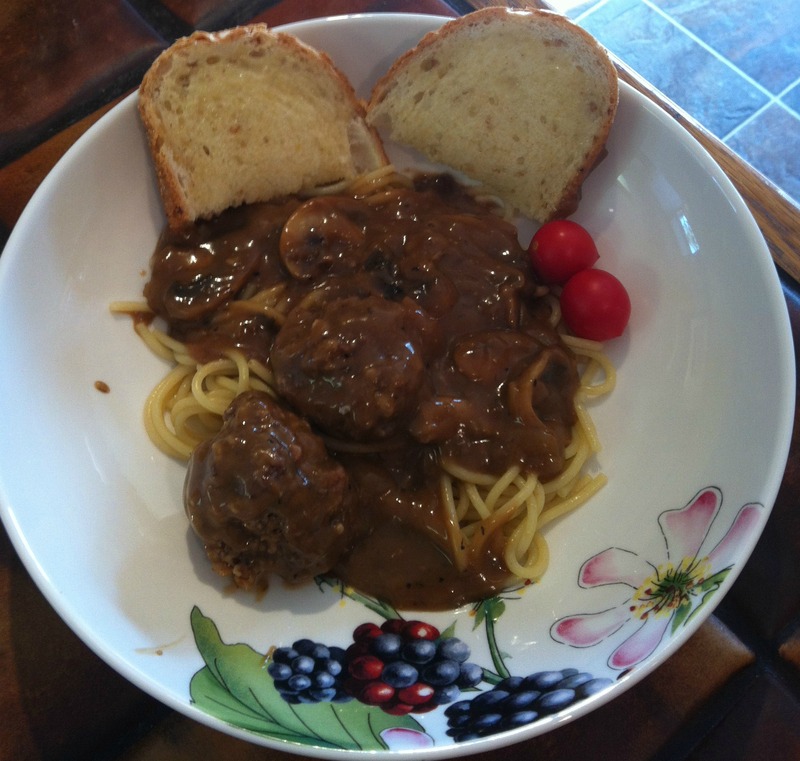 I served it over our favorite meatballs on a bed of pasta with garlic toast & fresh picked cherry tomatoes! Here is a picture… I took it with my IPhone so I apologize it is not the best. It was delicious!!! Quick & easy! So make sure to snag a few of your mama’s meatballs to have on hand for those quick meal days. ← *EXCITING NEWS* WildRose Gypsy Online Shop is OPEN for Business! !